Rusty Rider wrote: ... I have a problem and not being technically minded don't know the correct language for it. In these situations a picture speaks a thousand words, although two or three pictures may be even better. No, if thats not shifting down, its because the L limit screw is slightly too far in and might need unscrewing 1/8th or 1/4 of a turn. That will give the front mech more travel and thus knock the chain down to the inner/smallest chainring. The chain catcher then is there for if that were to drop. I need on because i have a 22-36-48 setup and it wants to drop shifting from middle to inner. The chain catcher has to be really close to the chain when fitted and it needs fitting with the chain already on that ring to properly judge it. Rusty Rider wrote: I've not had it come off the smallest ring just the middle one. Or maybe I should just change them and go for a 2 ring setup? If that makes sense. Only you know how strong your legs are up the hills. I barely use the granny ring but I can't bring myself to dump it when there is no real reason to. In fact a tiny inner chainring allows you to have closer spacing on the cassette, like 12-27t on the road. 22x27 is a really low gear. With 12-27t and 22-36-48 that covers everything for me but I hate using the granny so went back to 11-34t lol. I think one reason chains drop is it causes a big drop in the tension of the chain, as well as it being usually because of the limit screw or the middle ring was made bigger. If yours is shifting from middle to inner properly but its coming off the middle and onto the inner, the cable is too loose probably but I have no idea, but adjusting that can have the chain shifting off the outer. When its setup on the cable properly, you can shove the shifter all the way to shift off the inner to the middle and pedal it with the shifter held fully but with some light scraping, then letting go of it the mech moves in a bit. Thats the only way I can explain it lol. Thanks guys, problem is now solved,after a bit of adjustment I've taken the screw out just over 1/8th of a turn, which seems to have solved the problem, I've spent a half hour on the trainer indoors (to cold and wet outside) and its going up and down okay now. Never thought about the inner ring being not used I have been on it maybe 2 or 3 times, when I haven't wanted to get out the saddle because of a hill, much prefer to stay sat as I tend to wobble standing and pedaling (duff right arm and wrist). Oh and I've marked the screw if it ever changes. 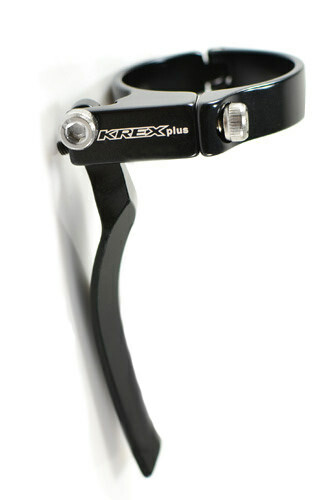 Just fitted the K-REX one to a full suspension MTB with a triple. £8.99 from Taiwan, if you don't mind waiting for it. It couldn't be any closer without touching, in three places. 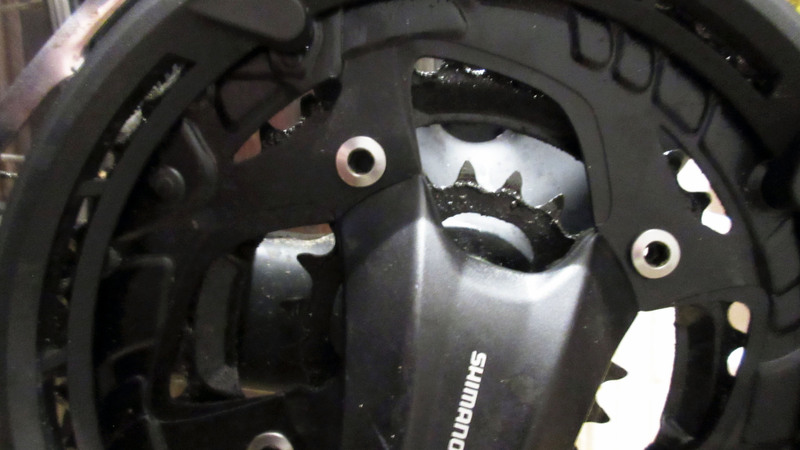 The front derailleur almost touches the outside of the arm of the chain catcher (0.5mm clearance). The arm almost touches the bike frame on the inside of it (0.5mm) and the clearance between the arm and the chain is extremely thin, looks to be more like 0.25mm as opposed to 0.5mm. The chain catcher is about as high as it can be, to still be useful. I first thought fitting it was impossible but gave it another attempt just now and there's no wiggle room left whatsoever, it is just about possible. My chain dropped the very first time I changed to the granny last night on a new setup, but it's probably because I am coming off a 36t middle to a 22t granny. On a MTB (or other) that's not got suspension, fitting this chain catcher with an arm on it was really easy, but on my full suspension frame has it has big arms in the way around the seat tube where the chain catcher fits. A dog fang chain catcher is not an option either, because the frame's seat tube doesn't quite go down as far as the 22t granny. You just couldn't tighten a dog fang onto it at the right spot. The same was true on my carbon hardtail MTB frame with its silly tapering seat tube down near the bottom bracket shell. Where the 22t inner chainring is, there's part of the bike frame in the way on this FS bike, so a chain catcher with an arm on it is the only option and as it is now, it's got no room for movement, in any direction. Yet to be tested on the road. Back using a MTB front mech (that's not a braze-on) I am totally out of ideas for what to use for a chain catcher. My seat tube where the FD clamps on is 34.9mm but it tapers almost straight away and goes fatter, so the clamp-on K-Rex posted above cannot be fitted, the tubing is too fat and the screw on the K-Rex only just meets the threads, with it able to slide up the tube even if it was viable to tighten it up. Can't use a dog fang for the same reason. Can't use a braze-on (K-Edge) because my front mech isn't a braze-on, the K-Edge one was able to be fitted in that situation. Maybe a chunky cable tie on the down tube (or 3 or 4) might work, but you can't keep the blocky bit of one of those lined up, the first time the chain drops it will knock it out of alignment, unless a bit of inner tube is put under the cable tie, maybe that could work. Manc33 wrote: Back using a MTB front mech (that's not a braze-on) I am totally out of ideas for what to use for a chain catcher. If you can attach some photos someone may come up with ideas. fastpedaller wrote: If you can attach some photos someone may come up with ideas. The only way I can see is a thick cable tie around something like the back of the seat tube then going under the down tube sort of diagonally. It's hard to see how anything could be lined up with the 22t inner chainring. There is a cable pulley at the back now going spare I could screw something into, like a bent spoke of some sort. Around the seat tube only probably won't work because however tight I make it there, it's thinner above that and it can always loosen off. You can see on the 2nd image, the front/bottom of the seat tube doesn't cut in far enough, but on the first image you can see the back/bottom of the seat tube does, hence why around the underneath of the down tube might be the best bet. Like this, but it's still not high enough and it can't go higher because it would just slip down the down tube, unless I put another wrapping above the first one, then it might be in line. In the past, I know I got a R443/R773 front mech to shift with a MTB left triple shifter, the snag was the cable had to be quite loose when the chain was on the granny ring, but it did shift from granny to middle and from middle to outer and back again, no problems. In fact the R773 is probably the best front triple shifting mech I have ever used, especially from granny to middle, it's as solid as it gets. Back then, I mistakenly thought the longer swingarm on those "R" front mechs meant they were supposed to be used on flat bar shifters, which I half-thought had unique 'flat bar' internals and I half-thought they just had MTB internals (they actually must have road internals, if they work with those "R" front mechs). So wait, that means I can just put the braze-on FD-6503 back on again - with it's chain catcher - and use a MTB triple left shifter! I know I can because the R443/R773 front mechs (that work perfectly with a 7703 left shifter) both can be made to work on a MTB left triple shifter, as long as the cable is loose on the granny. That's it, I can actually do it and have a chain catcher on. I don't care about a loose cable or half the shift not being there from granny to middle. I am lucky to have a bike that can accommodate either a bottom pull or top pull front mech. Another good thing is the FD-6503 shifts better on my 48-36-22 than my FD-M771 does, which is pretty weird. I think it's probably because the M771 front mech is only meant for use up to 44t, while the Ultegra 6503 front mech is made for up to 53t and in the scheme of things, 48t fits a mech meant for 53t better than a 48t fits a mech meant for 44t. So if anyone else is willing to use a braze-on road mech and have a loose cable on the granny ring, you can indeed fix this and use a chain catcher via the braze on route, even with a MTB left triple shifter. It's not pretty, but it's still a better option than having no chain catcher there at all. "It worked, but only if I had the cable deliberately too loose when on the granny ring, which I didn't care about because it did work." "The "Ultegra" R773 front mech (or the R443) can be used with a MTB left shifter, but it has to have the cable loose when on the granny (but who cares, it works)." "I used this setup myself with a XTR left shifter and a FD-R443 and FD-R773 and the only "problem" (not really) I had was you have to have cable slack at the end so, on the granny ring. Its a big push from granny to middle, but it still works and the shift from middle to outer to middle is just the same." 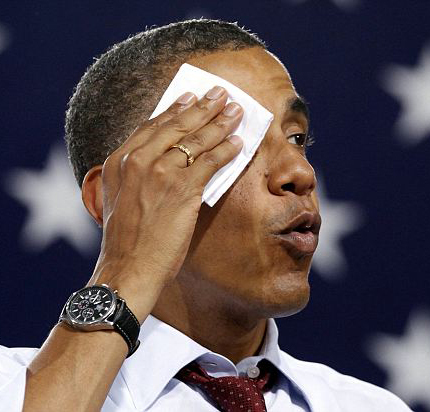 "I never really could fathom whether it was a match with my MTB shifter but it did work quite well"
I have said the same thing every year, I'll make sure to say it at some point in 2019 as long as I am not banned for spamming. A disc of plastic,the type and thickness plastic buckets are made from or similar or if available made from 2mm thick alu plate or similar. The disc is made larger than the inner with perhaps a cut out for the chainstay or just have a quadrant of of disc in the correct unshipping area . A hole is cut in the middle big enough to go over the thread on the EBB bearing cup,it's then trapped and held in place between frame and BB cup.For additional security to stop it slipping you could anchor it to the seatube or downtube with a cable tie through slots in the plate and a suitable spacer between plate and frame tube. It could work well with a bit of fettling/ingenuity and could look neat if made properly. 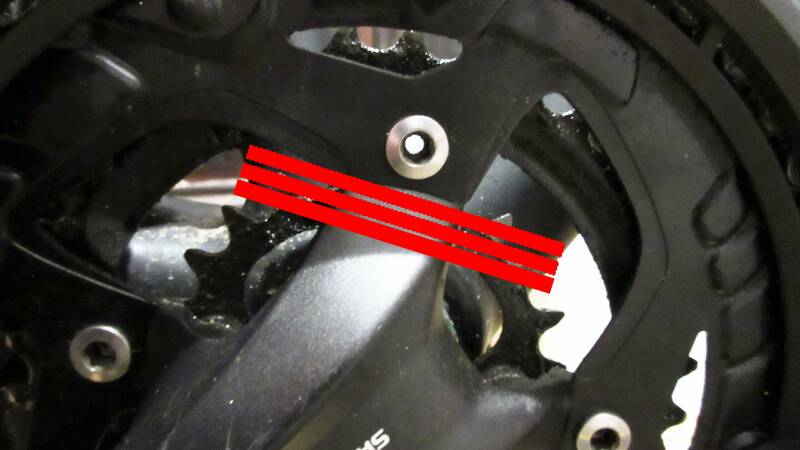 Note:- my MTB with EBB chainset has a spacer on the driveside which could be either replaced by the chain catcher or reduced in thickness by the thickness of the chain catcher. I just ended up putting a road mech on, it works on a wing and a prayer with a MTB shifter, in some regards it's better (no chain rub on middle>small). It just about shifts from granny to middle, while not going out too far on the outer, but one thing is if I cross chain it on the outer, the chain can rub on the inner plate of the FD. Using the last three or four small sprockets, no rub - which also means no rub at all on outer>smallest. The irony is I got more chain rub using the M771 front mech. Also the 6503 just shifts better than the M771, regardless of shifter used. It's definitely smoother on the middle>outer. Also the cable isn't all that loose on the granny ring, perhaps that's because I put my chainline at 45mm. I wouldn't advise running a MTB triple shifter with a road triple front mech but it does work assuming you don't cross chain it on the outer and lower sprockets. The setup is quite finicky, if I wind the barrel adjuster in 1 turn (or maybe only 0.5) then it possibly might not shift from granny to middle, although that would alleviate the rubbing on outer>lower sprockets. They should make braze-on MTB front mechs, but they seem to not exist. At last I have got a chain catcher on it.